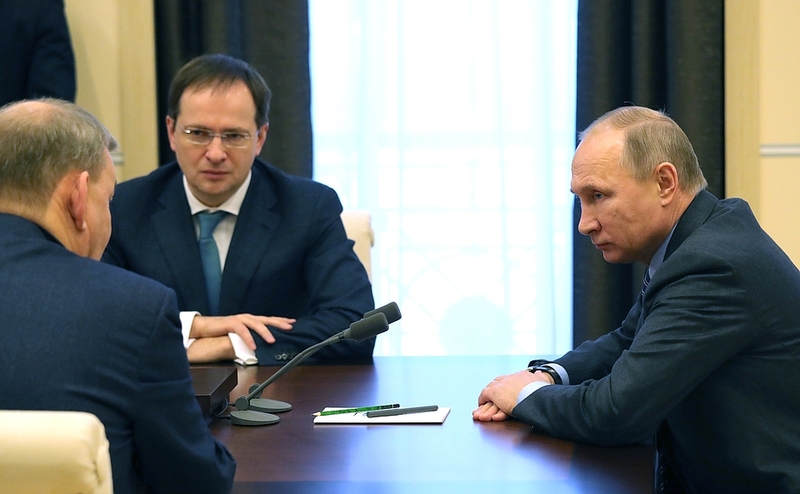 Vladimir Putin met with Culture Minister Vladimir Medinsky and General Director of the Bolshoi Theatre Vladimir Urin. The President supported the Culture Minister’s idea of extending Vladimir Urin’s powers as General Director of the Bolshoi Theatre. Mr. Urin, how long have you been General Director of the Bolshoi Theatre, three and a half years? Yes, Mr. President, three and a half years. The Culture Minister [Vladimir Medinsky] and I have discussed this, and we have agreed that, judging by what theatre lovers say, you have achieved a great deal. We have agreed to talk about life at the Bolshoi Theatre and your work there, including the material side of creative work at the theatre. Tell me about your plans. Do you need any additional support? Well, I can tell you that everything is going well at the Bolshoi Theatre. I am referring to the financial side of the matter. And so I have no financial requests. This is true, because I am aware of the general situation. But the theatre now has everything it needs for its operation. We are completing the renovations, as I have told Mr. Medinsky. The third and final phase includes the renovation of workshops plus rooms for visiting performers. Regarding our creative plans, I would say that we have entered a smooth working regime. We stage eight new performances every year. Mr. President, we have two stages. But then, you may be right, because attendance at Bolshoi Theatre performances is almost 100 percent, or more precisely 97.4 percent a year. In other words, the house is full almost every day. We could have continued to live on the performances that were staged 10, 20, 30 or even 40 years ago, but this would have created problems in the troupe. Performers must have opportunities to perform new roles, make new discoveries. This is extremely important for creative groups. We have a large troupe, and so eight new performances a year, considering that we have two stages, is an absolutely ordinary achievement. We give some 500 performances in Moscow, plus we have a busy touring schedule. This March, our opera troupe will perform Tchaikovsky’s Jeanne d’Arc opera concert in the Philharmonie de Paris. In late May or early June, we will go to Japan for the Russian Seasons. Yes, I wanted to ask you about this. How will the Bolshoi Theatre fit into the Russian Seasons? We go on these tours every other year, and people in Japan love the Bolshoi Theatre. This time we will take three performances there: two of them staged by Yury Grigorovich, who turned 90 this January, but you know this, because you sent your greetings to him. Thank you very much. We will take Swan Lake, Giselle and The Flames of Paris choreographed by Alexei Ratmansky. We will begin the tour with Swan Lake. We will give 12 performances in Japan, not just in Tokyo but also in other large cities. We will tour these cities. The bulk of our ballet troupe will go to Japan. Yesterday I held talks with our Japanese colleagues. They told me delightful news: nearly all tickets to the bulk of our performances have been sold out. It is only February, and the tickets are already in short supply. I was also informed of your plans to take part in events related to the FIFA World Cup. Yes, this is true. If everything goes as planned, on July 14, on the eve of the World Cup final, the Bolshoi Theatre will hold a gala performance to celebrate this magnificent event. The concert will feature performances by internationally acclaimed Russian soloists, as well as our foreign colleagues who agreed to perform at this concert. Most of them already agreed to participate in the concert, and preparations for this wonderful event are underway. Great. You have already mentioned, albeit briefly, the creative part of your work. But how about the financial aspect? My question is simple and pragmatic: How much do soloists and corps de ballet dancers earn? Yes, I was just going to tell you. The average salary for the whole theatre is 77,000 rubles. Corps de ballet dancers make 130,000, and soloists about 240,000 rubles. Opera soloists make 180,000, which is due to the fact that they have fewer performances. We have both our own and invited soloists singing in the theatre, so the figure refers only to our soloists, who make 180,000. Orchestra musicians have a lot of work, since they perform at both opera and ballet performance. Their average salary is 130,000. We increase their wages incrementally, little by little every year to the best of our ability using money we make. Talking about the bottom line, I can tell you that revenue from ticket sales rose from 1.4 billion rubles in 2014 to 2.2 billion 2016. We have been able to achieve this result by adopting flexible pricing. Some performances are very popular, and as soon as tickets go on sale they are gone in a matter of two or three days. There are also performances that are not as popular, but we are still able to sell out by regulating prices. Price adjustments can be substantial. Orchestra seating is the most expensive, followed by the dress circle, the upper circle is cheaper, and so on. By introducing flexible pricing we generated almost 800 million in additional revenue. The same goes for proceeds we get from sponsors. In 2014, these proceeds stood at 400 million, and last year we practically doubled this figure, earning 800 million from sponsors. However, 2016 may not be representative of a general trend, since we received substantial contributions from sponsors for bringing La Scala to Russia, which boosted our bottom line. Mr. President, we have ambitious projects in the area of international cooperation, and I very much hope that everything will come to pass. Serious talks with the Paris Opera regarding two joint productions are underway. We have almost agreed on one of them, War and Peace by Prokofiev. That is, we will work on it together. The Paris Opera will come here on tour and we will go there, accordingly, in 2018. We had serious negotiations with the Metropolitan Opera as well. We reached an agreement with Peter Gelb on a joint production of three shows. In March (I don’t want to jinx it), we will sign a protocol of intent on three joint productions. Of these three shows, two will premiere in Moscow and then in New York. We have interesting projects with La Scala as well. We have received them, and in 2018 La Scala Theatre will receive our ballet. I’m not even talking about this year, which is also very busy. I've already mentioned the tour in Japan and a concert performance of The Maid of Orleans in Paris. In addition to that, we will participate in the festival in Aix-en-Provence, France, which is a famous music festival. We are going to Finland with Iolanta by Tchaikovsky and Eugene Onegin. We will take Eugene Onegin to the festival in Aix-en-Provence, as well. All of that will take place this year. We will wrap up the year with a tour to New York. In conjunction with the Paris Opera and the New York City Ballet, we will bring Jewels by Balanchine to New York. We will also bring Taming of the Shrew there, which is immensely popular in Russia. After this show ran in the cinemas, the Americans asked us to come on a tour. We agreed. It's great. Mr. Medinsky, do you have anything to add to that? Mr. Urin was one of the youngest theatre directors in the Soviet Union. I believe he became one at the age of 26. I was 26 and a half. Well, young if not the youngest. Mr. Urin will celebrate his anniversary soon. Based on the excellent creative and economic track record of the Bolshoi Theatre, we are about to approach the Government with a proposal to renew Mr. Urin’s contract as the Director-General of the Bolshoi Theatre and are asking you to support us in this regard. It’s my pleasure to do so. Of course, I support this. 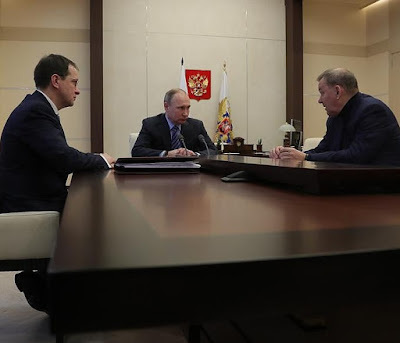 Vladimir Putin with Culture Minister Vladimir Medinsky, left, and General Director of the Bolshoi Theatre Vladimir Urin. Vladimir Putin, Vladimir Medinsky, Vladimir Urin. Russian President, Culture Minister, General Director of the Bolshoi Theatre. 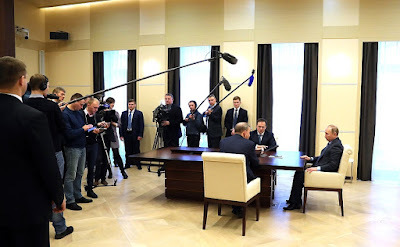 0 Comment to "Putin met with Vladimir Medinsky and Vladimir Urin"